Every once in a great while, I see a stamp set that gets me picturing how I’ll use it – all year long. And when that happens? I gotta pop it into my cart and stalk the mail man! Affiliate links may be used. Read more. 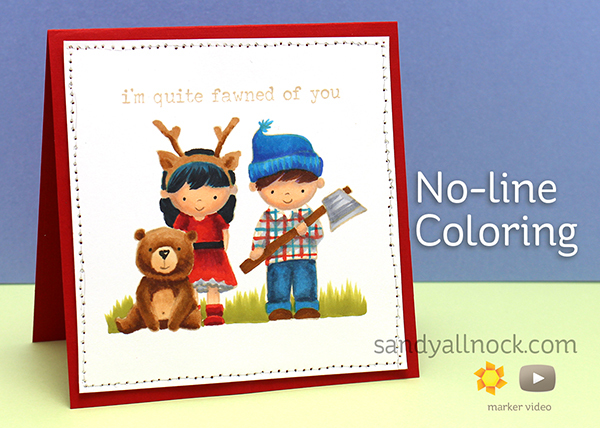 This Lumberjack Love set was one of those – first, I knew I wanted to do no-line coloring with it. That bear! Agh, so cute. And then I want to do fall cards. I see Christmas cards with that lumberjack cutting his own tree. And the little girl dressing up like Rudolph. Sweet when ideas start to flow, isn’t it? (Now I gotta remember to go execute these ideas when the season comes!) Watch the video below, or click HERE to see it in HD on YouTube. I had a big craft room accident after finishing the coloring – a beverage spilled! At first I wasn’t too worried, it was on the counter, and I didn’t see anything non-plastic laying down there. And then – I saw the stamped image leaning up against something else….in a brown puddle! AGH! I grabbed it and wiped it as fast as I could, but the bottom got all stained and warbly. Grrr! So instead of being a full A2 card, this one….well it turned into a square. Which I think is pretty sweet too! Best encouragement ever to try no-line coloring! Thanks for a tutorial for the no-line technique!!! Fabulous card. I like that you had a little accident because it looks great squared. Sandy this is an amazing card. Your colouring is just awesome. I had to pin this to try. This card is so adorable!!! – I love your no-line watercoloring (gotta stalk everyone else’s cuz I’m afraid to try my own)! 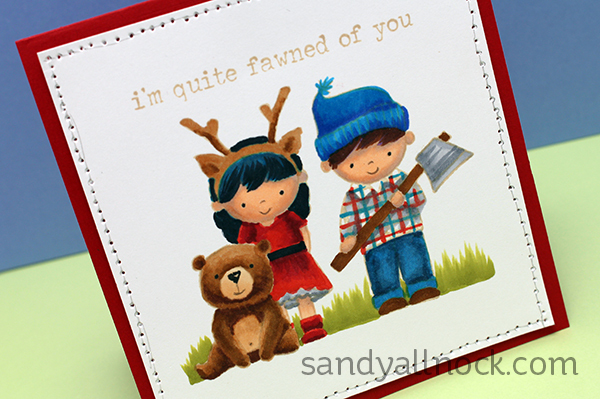 Sandy, what an adorable card. Love the technique of no line coloring, I must try that soon. Thanks for sharing. Thanks for doing this video I have wanted to do no kines coloring. I bought Memento London Fog gray ink do you think that would work. I love the edging you did with the piercing and pencil line. brilliant Happy accident after spilling that drink. I find no-line coloring very challenging, so I’m thrilled to see a video with the technique. Thanks Sandy!